This is the low approach. It is absolutely dominant among approach moves to the 4-4 stone. 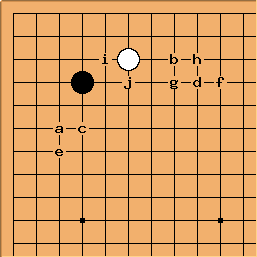 Based on the games recorded in the GoGoD CD, it appears in actual play about 50 times more frequently than the high approach move at a, for example. 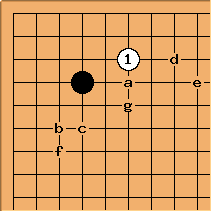 The large low extension at f.
The tsuke-nobi joseki at a.
Dave Charles is right of course. In the search above there are another 339 cases where White plays next, making tenuki the fifth most common continuation by Black. Question about diagonal attachment response moved to 4-4 point diagonal attachment joseki.